Most convenient hotel and nearest to airport. Efficient and effective service style. Excellent and environment to help you ready for a long trip travelling by aeroplane. As it is walking distance to the Guangzhou Baiyun airport. Thinking of a last-minute trip to Guangzhou and have no idea where to stay? Breathe easy! lastminute.co.nz offers tonnes of great places to stay that are sure to keep you smiling. 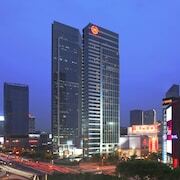 We have 673 hotel options that are within 10 kilometres of Guangzhou's downtown. Experienced travellers who understand the value of booking a hotel close to the action and bright lights of the city's heart should check out the DoubleTree by Hilton Hotel Guangzhou and Guangdong Hotel, all of which are situated within a 1-kilometre radius of Guangzhou's centre. Haizhu is where it's at if you're searching for somewhere with plenty of accommodations. 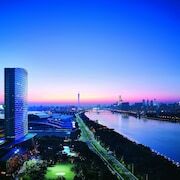 Choose between a range of awesome places to stay, including the Shangri-la Hotel Guangzhou and The Westin Pazhou. But that's not all! Tianhe is another Guangzhou neighbourhood bursting with hotel options. 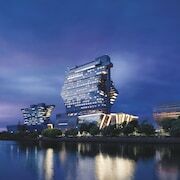 You can choose from around 164 places to stay in Tianhe, such as the W Guangzhou and Four Seasons Guangzhou. Zhujiang New Town and Zengcheng are other awesome options. The The Ritz-Carlton, Guangzhou and Grand Hyatt Guangzhou are in Zhujiang New Town. 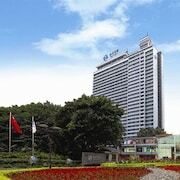 The Guangzhou Phoenix City Hotel and Zengcheng Hotel - Guangzhou are in Zengcheng. The Holiday Inn Guangzhou Shifu and Guangdong Victory Hotel are located in Liwan, while Hilton Guangzhou Baiyun and Oriental Resort - Guangzhou are part of the Baiyun area. 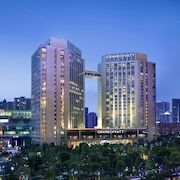 Check out the Mandarin Oriental Guangzhou or the Guangzhou Marriott Hotel Tianhe. 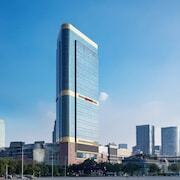 The Mandarin Oriental Guangzhou is positioned 6 kilometres from the main part of Guangzhou. 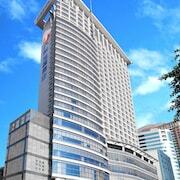 The Guangzhou Marriott Hotel Tianhe is situated 6 kilometres away. 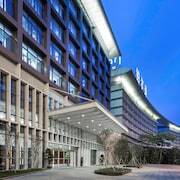 You could also choose to book the Sheraton Guangzhou Hotel or the The Westin Guangzhou. Thinking you'd like to travel further afield? You've picked the right place! Pearl River Delta features many other things to see. Pearl River Delta boasts coastal plains and rivers, as well as commonly visited Pearl River Delta tourist sights like the temples. Or join the locals in the bungee jumping while you are here. Dongguan is 55 kilometres to the east of Guangzhou and is where you'll find the New South China Mall and Liuhua Park. If you'd like to visit Dongguan, check out the room rates at the Pullman Dongguan Forum and Tangla Dongguan. Or, you could consider staying in Foshan, 25 kilometres to the southwest of Guangzhou, where you'll find the Swissotel Foshan and Crowne Plaza Foshan. If you're staying in Foshan, set aside some time to visit the Zu Miao and Renshou Temple. Before you say "see ya later" to Pearl River Delta, ensure you catch a local game. Find Guangdong Olympic Stadium to the east of Guangzhou. The Shangri-la Hotel Guangzhou and the Soluxe Hotel Guangzhou are near the action. If you're flying into or out of Baiyun International Airport and want to stay nearby, try the Pullman Guangzhou Baiyun Airport or the Guang Sha Hotel.